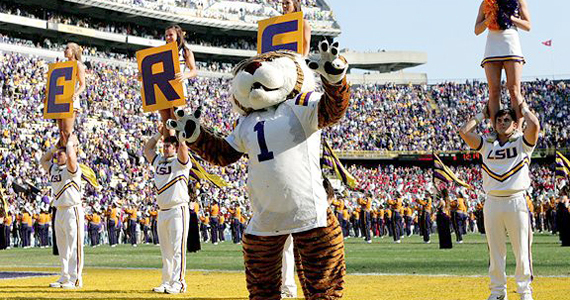 Big League Clu finishes up his college footbal top 25 preview. So here we are everyone, the top of the top. Not everyone may agree with what I say here about these teams, but frankly…I just dont give a damn! So sit on it, as someone important once said. These teams each fought and clawed their ways last season. I look forward to seeing who might still be at the top of this list at the end of the year and if one of them might be hoisting the National championship in January. Next Game: Against Arkansas State 9/1/12 @ 10:30 p.m.
Oregon is currently the three-time defending Pac-10/12 champion. However, many have already picked USC to win it this season, so have November 3rd circled on your calendars everyone. That could be a very big matchup for both teams. 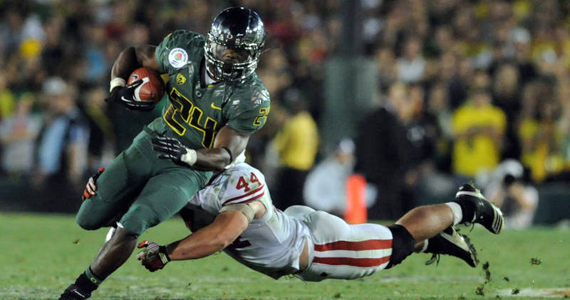 The Ducks shouldn’t have any problems running the ball this year, with Kenjon Barner taking over for LaMichael James (who is now on the 49ers). Barner had almost 1,800 yards in three years as James’ backup. Last season he ran for 921 yards and had 11 rushing TDs. The real issue will be at Quarterback, where Bryan Bennett is the leading candidate to start the opener. As a freshman, Bennett had 369 yards passing, 200 rushing yards and 6 TDs. BUT! True Freshman Marcus Mariota was the star of Oregon’s Spring Game and established himself early on, so the Ducks will likely find themselves in a duck hunt of their own to see who’s going to become the starting QB. Luckily for them, they do have some pretty easy non-conference games early on… so it will probably be a good way for them to test out who they feel more comfortable with before they start getting into the nitty gritty of the Pac-12 schedule. 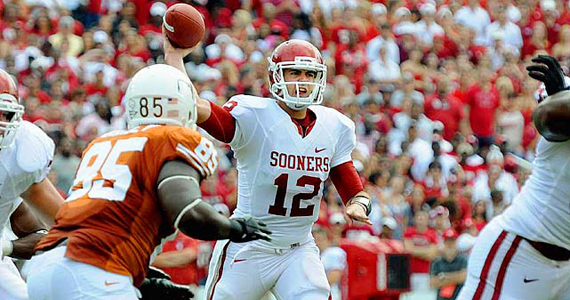 Next Game: @ UTEP 9/1/12 @ 10:30 p.m.
Senior QB Landry Jones is just an absolute beast and has pretty much has been his entire career with the Sooners… As a Sophomore, Jones threw for 4,718 yards and 38 touchdowns (12 INTs) and last season he threw for a mere 4,463 yards with 29 touchdowns (15 INTs). He basically holds almost every single season and career record as a QB at Oklamhoma, which is chump change if you ask me! He has said he wants to win a championship with Oklahoma, and in all honesty, this could be the year for that. OU brings back a ton of players on offense, which will make their team even more dangerous. Running backs Dominique Whaley and Roy Finch are back, along with wideout Kenny Stills (894 yards receiving, 8 TDs). Oh and don’t forget that they also bring back their entire O-line for 2012. So with all of them returning, would you think that OU would have a drop off in offense? I mean the team averaged 39.5 points and over 500 yards per game. The only thing you can argue here is that Haley is coming back from a broken ankle, and Kenny Stills has not really lived up to expectations like I personally thought that he would have. Don’t get me wrong. He is playing phenominal football, but everyone thought he was going to become the next Jerry Rice for God’s sake. Next Game: against Hawaii 9/1/12 @ 7:30 p.m.
Well hey! Welcome back Southern Cal! A lot’s changed since you were left out of the NCAA top 25 thanks to the Reggie Bush scandal. USC hasn’t been this excited since the Pete Carroll days, except now they’re run by Lane Kiffin & Co. Also for the Trojans, they happened to go from being a really good team to an amazingly awesome going to compete for a national championship team. The biggest boost, of course, was the acquisition of Penn State transfer running back Silas Redd, who is eligible to play as a transfer due to the NCAA sanctions handed down for the Sandusky scandal. Redd, who happens to be local prodigy from Norwalk, CT, ran for 1,241 yards last season. His addition to the backfield basically gives them a two headed monster running back. With Curtis McNeal and Redd, the trojans will have two former 1,000-yard rushers. What was once considered one of the weaker parts of the depth chart for the pass-happy trojans is now a strength. 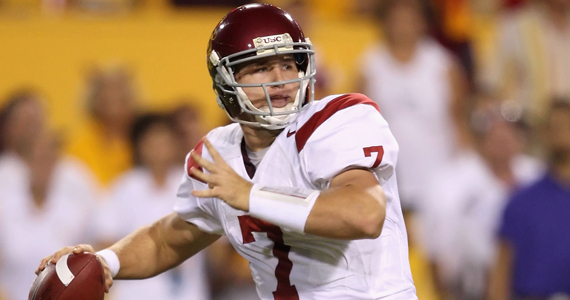 Oh and even though I’ve been talking about the running game of Southern Cal, they also boast a pretty amazing Quarterback in Senior captain Matt Barkley. Last season he threw for 3,528 yards, 39 TDs and only 7 INTs. USC has a really good chance at winning the PAC-12 this year. Ss mentioned above, watch out for the Oregon/USC game. It could be the big time conference match up of this season. Alabama boasts probably one of the best defeneses in the nation…on paper. Michigan will certainly put that to the test, not quite 300 style but we’ll certainly see what the Crimson Tide are made of come week one. 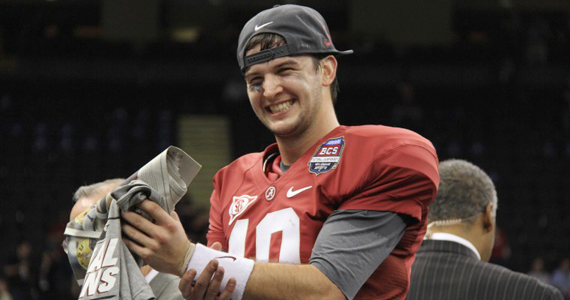 Tides QB AJ McCarron will more than likely be given more responsibilities, since he managed the game so well against LSU in the BCS title game shutout last year. As mentioned before, Alabama’s defense looks to be pretty tough to beat, and they do boast some good players throughout the depth chart. I would have to say to look out for DT Jesse Williams and CB Bradley Sylve (whos been playing summer ball with a cast on his left hand for goodness sakes!). Alabama does, unfortunately, have probably one of the toughest first months of the season out of any program in the country. They play Michigan and Arkansas in the first three weeks of the 2012 season, which will test how good this team is on both sides of the ball. Next Game: against North Texas 9/1/12 @ 7 p.m. So it’s official (Hurricane Isaac pending). 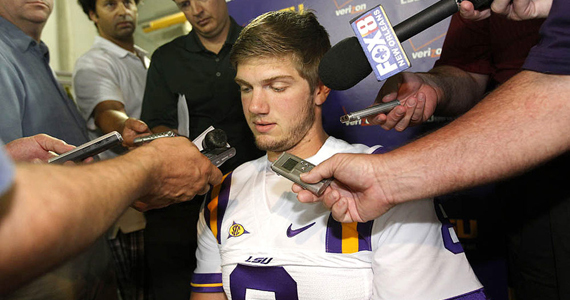 Zach Mettenberger will be making his long-awaited debut as LSU’s starting quarterback. Many of you might remember that Mettenberger was one of the biggest recruits at the University of Georgia about two years ago before being kicked off the team due to an arrest (and guilty plea) for two misdemeanor counts of sexual battery (obviously a day im sure Zach wants to put past him). With Mettenberger now under center for the Tigers, it allows head coach Les Miles to open up the playbook a little bit more and now he can throw the ball down the field. But the biggest issue that LSU has to deal when it comes to playing in Baton Rouge this fall will be their lack of experience on D. This is a result of the dismissal of All-American CB Tyrann “The Honey Badger” Mathieu due to his violation of both team and university policy. He is now replaced by freshman Jalen Mills. The Tigers will be young on defense, but you can count on FS Eric Reid, who happens to be one of their more talented and experienced leaders , and with Tharold Simon to lead the way for their younger teammates.